For the "World of Wonder" theme, here is LEGENDS OF THE DC UNIVERSE #5, the conclusion of "Moments" by William Messner-Loebs and Mike Deodato. It takes place early in Diana's post-Crisis career as an ambassador, and involves her losing some illusions about the outside world. 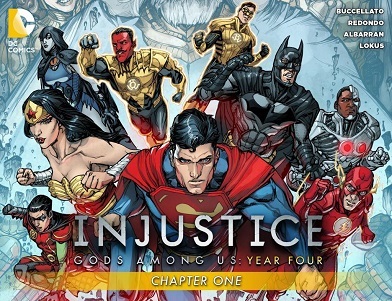 One of the free books to be given out for Wonder Woman day and you can already see it free on comixology. Here's four pages, wherein Diana introduces Bumblebee to Zeus, her father. Recent comics have made me all nostalgic, so here's a scene I loved and some fanart I find fun. Four pages from today's Wondy. Four scans apiece from Incredible Hercules #129 and Wonder Woman #32. Whatever else he may have gotten weird or wrong, I give WML this: he did truly understand at least two fundamental things about Diana. One, that for all that she's a princess, she doesn't have a haughty or judgemental bone in her body, and two, that she has a real talent for turning her enemies into allies and even friends (I especially like what he did with the Cheetah, making her a bit of a combo Magneto/Two-Face in her relationship to Diana - but not how he got there, so that one's definitely not in this series). We see both of these character traits during the middle bulk of WML's tenure, a time I like to call "Wondy flips burgers." Admittedly she's actually working at a taco joint, but you can't tell me that makes a practical difference to the connotations. Next time: Diana breaks atmosphere again to visit Thanagar and save the last Vuldarian in a Very 90s Crossover that somehow manages to be ridiculously fun regardless. Alright, both by request and because I myself feel something at a loss with it gone, here commences the repost of my When Wondy was Awesome series from our LJ incarnation. We'll begin, as is proper, at the beginning - the origin of the character as she is now. The concept of Wonder Woman, of course, is one of the oldest in Big Two comics, as she was first created by Marston back in 1941. However, once the Golden Age ended and the character passed into other hands, she became something of an albatross to the company - they were under contract to keep publishing her, but they didn't really know what to do with her, and her title quickly devolved into a miserable sexist mess from which it never entirely recovered. Thus, with Crisis on Infinite Earths, Editorial completely erased Wonder Woman from past continuity, deciding she would enter the DCU for the first time in the late 80s - allowing them to start over and try to really do her justice. 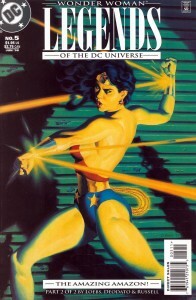 After a long (and terrifying to read about for fear of what might have been) process, they finally found a team that they thought could both create a new and viable character, and preserve the essence of the one who came before; thus Diana passed into the hands of Greg Potter and the now-definitive George Perez. 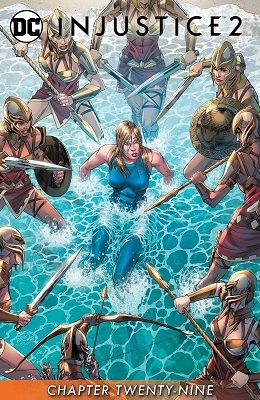 Next time: The nonsensical American flag bathing suit is made to make some small sliver of sense, we learn what kind of person inspires an amazon and why we should care about Steve Trevor, and Diana kills a hecatoncheries, as we tackle the second, less prominent but no less awesome half of Wonder Woman's origin.